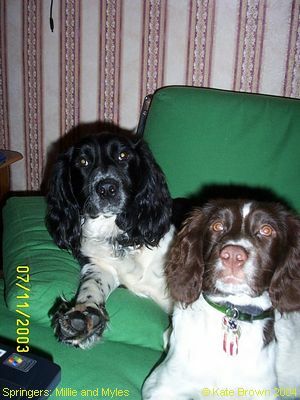 These two gorgeous Springers are called Millie and Myles. Millie is 7 months old (at the front) and brown and white. Myles at the back, languishing on the cushion is 1½ years old, and black and white. They get on well together and are good company for their owner Kate, and her husband. Millie at only 7 months old when this photo was taken has yet to grow her “feathering”; whereas Myles already has the Springer's distinctly furry feet!